This past summer has been a most difficult one for members of the Metropolitan Detroit community. Tensions over the conflict in the Middle East have made channels of communication between people of the Muslim and Jewish faiths close down. As we celebrate the Jewish New Year and the season of Ramadan, I would like to underscore how important it is for people of different religions to pull together and find ways to dialogue with each other to prevent our world from becoming a more and more hostile place. Interfaith dialogue is the understanding that all of our faiths have the same supreme energy. Respect and understanding for each other will never grow, if we do not reach out to get to know one another. Instead of working toward an interfaith tolerance, communities most often use religious beliefs as an excuse or a camouflage for political gain. 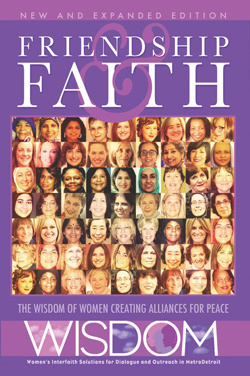 Most recently, in order to combat religious misunderstanding in our community, one Jewish, and one Muslim, and two Christian women came together over the summer to form an interfaith conversation called WISDOM (Women’s Interfaith Solutions for Dialogue and Outreach in MetroDetroit) – a forum for women of all ages and all religions to share their diverse religious views and to participate in community service projects in the Metropolitan Detroit community. While working together in August on a Habitat for Humanity house in Pontiac – putting up siding, windows and doors – 55 women shared prayers for World Peace and personal stories about their faith. The spiritual energy generated was so powerful that this interfaith group already has plans for an event in October to help HAVEN, a refuge for victims of domestic abuse, and an event in December to package food to feed starving children throughout the globe. WISDOM is one beautiful example of what people can do to bring together Christians, Jews, Muslims, Baha’is, Sikhs, and Buddhists, among others, to further interfaith understanding while helping to repair the world. Religion is not about what we believe, but how we behave! We all need to reach out to our neighbor, and to behave in a more compassionate way toward one another in order to dispel the ignorance and prejudice that divide us.